In the turbulent years of the Bolshevik Revolution. the Orthodox faithful of Petrograd found refuge in the calm, spiritual constancy of their beloved archpastor. His kindness and simplicity had long ago won their hearts, and it was no surprise when, in the summer of 1917, he was elected metropolitan by popular vote. A few months later the God-hating communists came to power and began dragging the Church to her Golgotha. It was a time of choice—between a martyric confession and the kiss of Judas. Inspired by that master deceiver and father of lies, the communists tried to conceal their base intent. They were reluctant to make known their militantly anti-religious policy, and publicized their actions as assisting the good of the majority, twisting opposing religious conviction into censurable political dissent. But they were hard pressed to catch in their nets Petrograd’s chief hierarch. In the midst of the political upheavals which characterized this corrosive period of Russia’s history, one could scarcely find anyone in a position of authority more apolitical than Metropolitan Benjamin. His utter disregard for politics did not stem from any weakness or aloofness in relation to his flock —he was warmly attentive to their individual and corporate needs, and they repaid him with their devotion. If it appeared that he did not actively oppose the communists in his personal dealings with them, it is because he saw the abyss separating this world from the eternal kingdom, and he could not condemn his adversaries but only pitied their blindness. He understood the futility of physical confrontation and, as a true shepherd, he did everything he could to protect his flock and to avert occasions for violence. An incident, recorded in the diary of a woman who witnessed the horrors of this revolutionary period, illustrates the close relationship between the Metropolitan and his flock and the absolute confidence he inspired in them, allaying the tension of the times. As I walk down the streets and see the expression of hopeless misery in nearly all eyes, except those of Bolsheviks and soldiers, it seems to me that Joy is dead and gone forever, while only Misery thrives. I have reached the point now, where I hate to go out and see those suffering eyes, full of anguish, hopelessness and utter despair. Only the churches seem to be unchanged and as I enter our hospital church or the great Alexander Neysky Cathedral where I go more and more often these days, my troubles seem to leave me at the threshold and I find inside all the peace and beauty that is so utterly lost everywhere else. Evidently many people feel the way I do, for the churches are always crowded to overflowing and the congregations stand patiently through the very long services, apparently loath to go home when finally they are over. In fact the longer the services the better they seem to like it, even though the all-night services sometimes last twelve hours, beginning early in the evening and ending at dawn with general confession followed by Communion, reminding one again of the first days of Christianity. The Metropolitan seems to think that we should all be prepared for the unexpected death that can overtake us at any moment and therefore conducts these night services personally once a week. The singing is always beautiful as his great choir is justly considered one of the finest in Russia. There is no electric glare, only the candles and lampadas burn softly in front of the holy icons, the air is warm arid fragrant with incense, the sermons are truly inspired, and above all a wonderful feeling of peace pervades the whole church. The spirit of old Russia, though dead everywhere else, is still alive in the churches, where it seems to have taken refuge as in a last stronghold. I cannot explain how soothing it is to hear the familiar words of the prayers and hymns that we have known since our childhood, to see the solemn eves of the same old saints looking down on us from beneath the silver and gold of their jeweled crowns, to listen to great orators really inspired by the mystic beauty of the hour. We stand all night long, hardly ever sitting down, and yet when we go home we are not tired, not in the least—on the contrary, we seem fitter than ever for the day’s work. He was obeyed, of course, and the service continued as if nothing had happened, though personally I was shaking from head to foot and even now have not recovered from the horror of that episode. In their mounting campaign against the Church, the communists called for the confiscation of church valuables under pretext of alleviating critical food shortages caused by economic chaos and the ravages of civil war. They counted on the resistance of believers to provoke a conflict and place the church authorities in a culpable position where they could be charged with obstructing the common good. 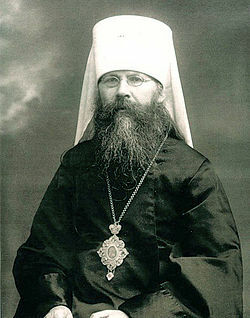 As head of the Petrograd Diocese, Metropolitan Benjamin was personally responsible for implementing the communist directives in this matter. To avoid the bloodshed which other areas had already experienced through enforced confiscation, the Metropolitan set forth a proposal for the voluntary confiscation of church valuables, insisting, however, that distribution of funds should be left in the hands of the parishioners themselves; everyone knew the communists’ humane intent was but a sham. 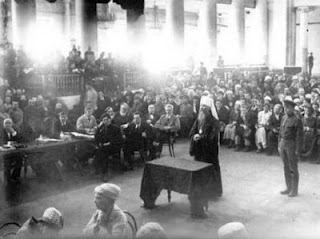 The Petrograd communists welcomed the Metropolitan’ s cooperation, but their leaders in Moscow were furious at the success of the Petrograd campaign which only served to increase the prestige of the Church and the clergy for their self-sacrificing and genuinely charitable attitude. Another tactic was needed if the communists were to succeed in destroying the Church’s authority. They hired their Judases and moved for direct control. The Metropolitan at once recognized this as a political move calculated to destroy the Church from within, and he issued a decree expelling Vvedensky from the Church until he should repent of his rebellion. The communists were incensed at this rebuke of their candidate and threatened the Metropolitan with court proceedings if he did not revoke his decree. Aware of the danger to the Faith posed by the revolutionary “Church,” the Metropolitan stood fast, knowing full well that in so doing he sealed his fate. These were his last words to the court.